I just got the October issue of Vogue and there’s a ton of stuff in there about Bollywood. 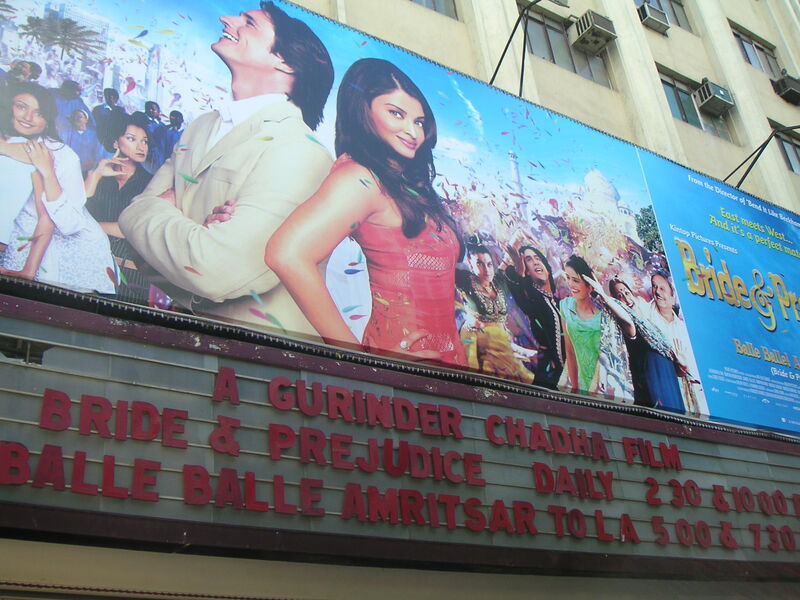 Most notably, there’s mention of “Bride and Prejudice,” the new movie from Gurinder Chadha (the director of “Bend It Like Beckham”). The film comes out in L.A. and NYC on Christmas Day, but it just had its debut here last weekend…and we went to see it! Okay, so the press here mostly lambasted the movie, saying it was too watered down. The critics over here are ruthless, too, some saying Aishwarya Rai (aka, “the most beautiful woman in the world” – warning! heavy flash on the website!) has never really been much of an actress so she shouldn’t bother trying the crossover to more English-language films and, ultimately, Hollywood. Pshaw! As much of a plasticky, Barbie doll type that she is, she did a fine job, and I think I may even be a fan. “Bride” had a simple story line – adapted, of course, from “Pride and Prejudice” – so we knew what we were getting into as far as that was concerned. On the other hand, the entire movie-going experience was a treat. The opening weekend in Mumbai of a much anticipated Bollywood movie in a sold-out theater (for which we had to buy scalped tickets from the mob racket outside) – what could be cooler?? Well, the theater itself was quite neat. Bombay has tons of art deco buildings, but the theaters are especially grand: high ceilings, balcony seating, decorative motifs on the walls and such. The seats were also throwback, but not terribly uncomfortable. At intermission, I also “enjoyed” visiting the toilets, as there were six stalls, three of which were labeled “Indian” (aka, glorified hole in the ground) and three of which were labeled “European” (no jokes please!). Anyhoo, we got our seats (not in the balcony, unfortunately, because tix were scalped, but good seats nonetheless) and Anthony went for popcorn (you can get salted, caramel, or mixed here, and you don’t have to buy a jumbo size either). While he was getting the snacks, I was surprised by a sign on the screen: “Please rise for the National Anthem.” They play the anthem before movies here?! And here I thought the U.S. was too gung ho about its anthems before sporting events. It’s a pretty anthem. The noise in the theaters can be deafening. I’ve seen one other movie here so far – The Bourne Supremacy – and practically needed earplugs. But it worked for this song and dance movie. It was colorful, lots of fun, some “Grease”-style music. It made both Anthony and me want to visit Amritsar (at least, the Amritsar of film). By the way, the dubbed Hindi film playing concurrently was titled “Balle Balle Amritsar to L.A.” Doesn’t that just roll off the tongue? So, come Christmas, I recommend you go see this film, especially if you’re with family and want something light and happy to see. There are some good laughs in there, too. On a related note, Anupam Kher, the actor who plays the father in “Bride” was just sort-of ousted from his position on the Indian Film Censor Board. Apparently the Leftists were “cleaning house.” Seems to me that his role on the board is a conflict of interest in the first place. Anyhow, it’s front page news. This past week’s show was a riot, with special guests Madness and Leslie Phillips of old Brit comedy fame. I never knew the latter, but now I think I’m going to have to get the whole “Carry On…” series now. (It’s on my wish list on Amazon in case anyone cares.) ‘Austin Powers’ got a lot of his mojo from Phillips’ caddish character. Madness played at the end of the show while the family and the old git sat on the couch and enjoyed it. Meanwhile, the actress who plays Mrs. Kumar was making samosas and passing them around during “Our House.” A really bizarre scene. Alas, I’ve been watching too much tele (must wake up at 6am on a Saturday to watch the Yankees!) and been on the computer too much, too (though not blogging, sorry). But happy hour calls and I’ve got to go. Hmm … Hindi movie … scalped tickets … you seem to be in love with “Bollywood”:). Not that it’s a bad thing. Btw might I suggest a viewing of “Rangeela”. Btw rangeela means colorful (or should i say “colourful”). It was released around ’95 i believe. Lovely movie woven around Bollywood. Not sure if the subtitles would do much justice but i guess you’re pretty comfortable with Hindi by now.